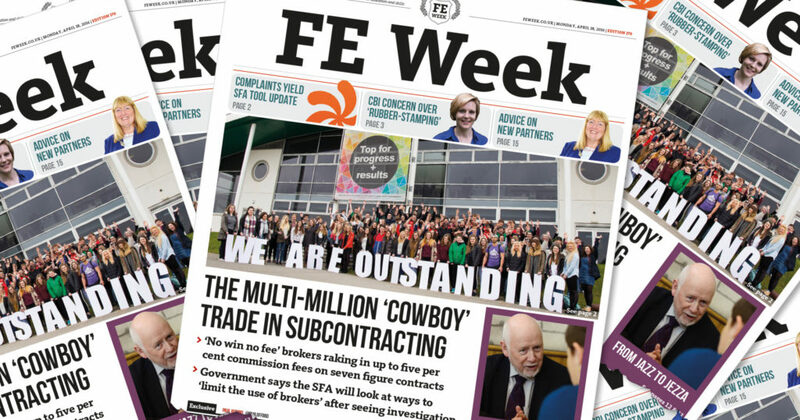 The use of public funds to pay brokers’ fees will be banned, thanks to an award-winning FE week investigation which forced the Skills Funding Agency to take action. Our exposé of this secretive industry in April (pictured) – the first of its kind – blew the lid on the underhanded way in which brokers matchup subcontractors with government funded providers and earn millions by charging up to five per cent commission on any agreed deal. When it was first presented with compelling evidence, the SFA said it would “review” funding agreements in an effort to “limit the use of brokers”. However, following an inconclusive answer from the agency in September when we first checked in on this review’s progress, FE Week asked again after our investigation won the prestigious CIPR award for Outstanding Further and Vocational Education Journalism last week. This time, the answer was crystal clear: civil servants now plan to wipe out the practice. Brokerage is not specifically mentioned in the draft apprenticeship funding rules for training providers, which will also apply from May 2017, but the Department for Education confirmed that it would be covered by section 67.11. Mark Dawe, the boss of the Association of Employment and Learning Providers, welcomed the SFA’s newly tough stance. “With the levy’s arrival and the new subcontracting rules, no one should complain if brokerage fees become a thing of the past. David Hughes, head of the Association of Colleges, agreed, saying it was “good to see them delivering” on the initial pledge the SFA made to FE Week seven months ago. “As the apprenticeship levy changes start to be implemented, it is important that the SFA, alongside the new Institute for Apprenticeships, monitors the system to ensure there is no abuse,” he said. Our April investigation found a number of brokers advertising subcontracting opportunities through closed groups on LinkedIn. In one notorious example of the practice, FE Week found an advert with Essex-based consultants EEVT Ltd, attributed to a company called The Funding Brokers Ltd, which we tried unsuccessfully to contact. At five per cent commission the brokers could have earned up to £5 million over this period. Birkenhead-based funding4training was one of the few brokers found with an official website. Its services were also publicised by Essex-based consultants EEVT Ltd.
One of its newsletter adverts stated that its five per cent broker fee was “negotiable depending on the provider”. The firm’s director of sales and business development, Benn Carson, told FE Week at the time that his firm was different to other, more disreputable competitors. Excellent – I applaud you. It’s a travesty that huge organisations are often awarded funds they cannot expend and in a panic utilise brokers to “spend” this funding, often with only weeks left in the contract life. Far too many smaller organisations who are best placed to deliver are starved of funds – they cannot possibly compete in a bidding war. When will the inequity of effective, locally based providers closing be addressed? This in the face of large providers garnering funding pots large and small, sitting on this funding and charging management fees to those who bail them out. This money must be spent on those who need it most. The learners, but also importantly the staff who work tirelessly for humble salaries in smaller community-based provision. Keep up the good work FE Week. A voice for the voiceless in this brutal training and funding arena.